Three days after Catalonia's unrecognised declaration of independence, the Spanish government will on Monday (30 October) start to take control of the region's administration. On Saturday, the Spanish official bulletin published the decrees to apply article 155 of the constitution and suspend Catalonia's independence. 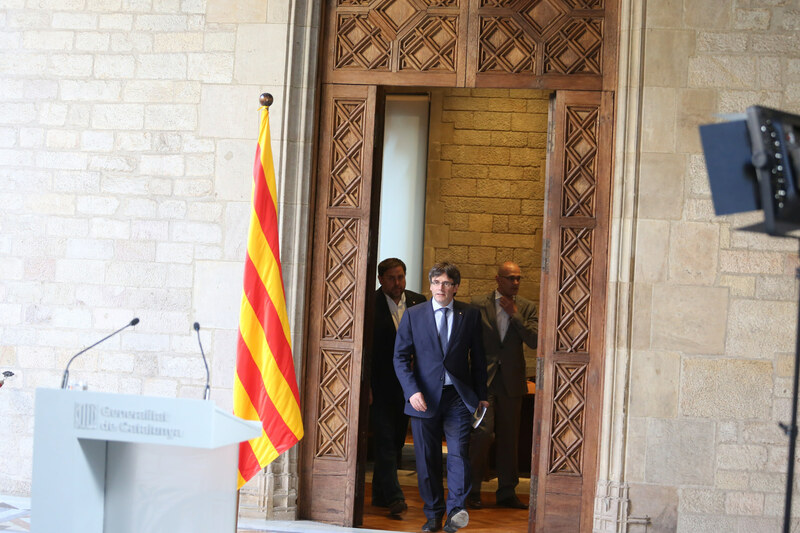 The president of the Catalan government Carles Puigdemont was dismissed and replaced by the Spanish deputy prime minister Soraya Saenz de Santamaria. Madrid had earlier dissolved the Catalan government and called elections for 21 December. 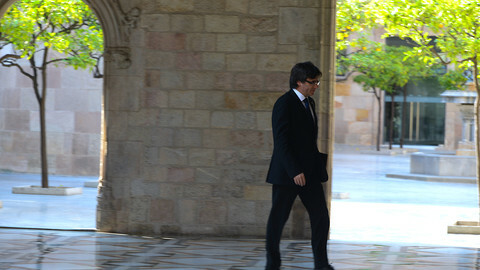 The interior minister took control of the Catalan police, the Mossos d'Esquadra, firing their chief Josep Lluis Trapero. On Sunday police stations followed orders to take down the institutional pictures of Puigdemont. The government also closed the Public Diplomacy Council of Catalonia (Diplocat),11 delegations abroad and dismissed Amadeu Altafaj, the head of Catalonia's delegation in Brussels. 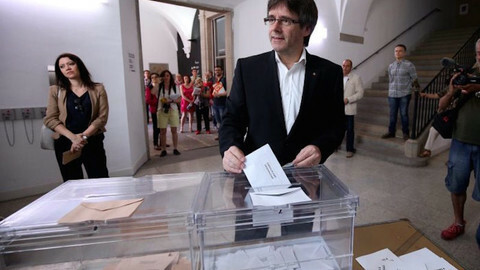 The measures "are the necessary and indispensable steps to restore democratic legitimacy to self-government," said prime minister Mariano Rajoy. While the Spanish government has laid out most of their immediate plans for Catalonia, the discharged Catalan government still has not resigned. The question is whether the Catalan ministers will still show up to work on Monday, who the civil servants will take orders from, and how. On Monday morning, the Spanish flag was flying over the Palau de la Generalitat, the government's building. Puigdemont posted a picture of the medieval building on his Instagram account, with a comment saying "bon dia" (Hello). But there was no clear indication of whether he was actually there. "Our will is to continue working to fulfil the democratic mandates and at the same time to seek the maximum stability and tranquillity, understanding the logical difficulties involved," Puigdemont said on Saturday. "We need to have patience, perseverance and perspective," he added, while vowing to "continue to work to build a free country." Puigdemont is expected to be charged with rebellion on Monday for his role in the Catalan parliament declaring the region's unilateral independence on Friday. If found guilty it could cost him up to 30 years in prison. His entire cabinet will also be facing the same criminal charges in the Spanish National Court, while parliament speaker Carme Forcadell and her team will be facing them in the Spanish Supreme Court instead, Spanish media said. "We cannot recognise the coup d'etat against Catalonia, nor any of the anti-democratic decisions that the PP is adopting by remote control from Madrid," said Puigdemont's deputy hand Oriol Junqueras in an open letter on Saturday in El Punt d'Avui, a pro-independence newspaper in Barcelona. "The president of the country is, and continues to be, Carles Puigdemont," he said. 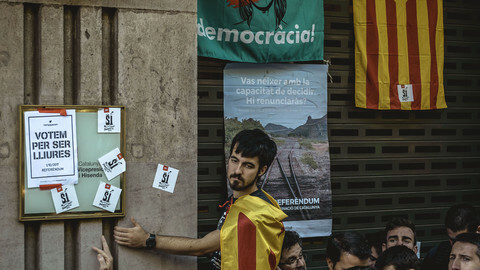 Meanwhile defenders of Spain's unity took the street of Barcelona on Sunday. More that a million people, according to the organisers, 300,000 according to the police, gathered in central Barcelona covered in Spanish and Catalan flags. The anti-independence group Societat Civil Catalana organised the march calling for "We Are All Catalonia. Common Sense For Coexistence!" 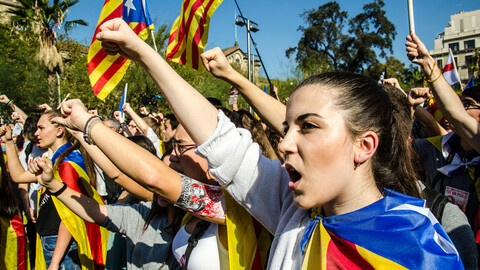 The protest was headed by political leaders of different pro-union parties in Catalonia, such as Ines Arrimadas from centre-right Ciudadanos, Miquel Iceta from the Catalan Socialists, and Xavier García Albiol from the Catalan Popular Party. Several high-ranking government officials from Madrid also took part in the rally. With a Spanish flag tied around his neck, Luis Aguilar walked with the crowd down the Passeig de Gracia in Barcelona. "This is a situation that we should not reach in Spain, because Spain is a democracy. It is a situation that is not democratic and is affecting the coexistence between people and this is affecting the economy a lot because the companies are leaving," said the 48-year old economist from Barcelona. "We will have to pay for this for many years," he said while the crowd around him sang "Viva Espana." "We are here to defend the union of Spain. This is a region like the rest and together we all make Spain richer," said another participant, Barbara Gerona. 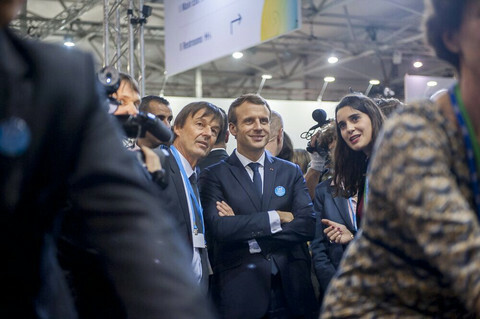 The 43-year old industrial engineer from Barcelona trusts the new measures put in by the central government in Madrid will help get things back to how they were. "The state is going to make legality come back and reinstate order. There will be elections and everyone will choose what we understand is best here," she said. The crowds continued to chant "We Will Vote", "Puigdemont, Go To Prison", and "Arrimadas for President". 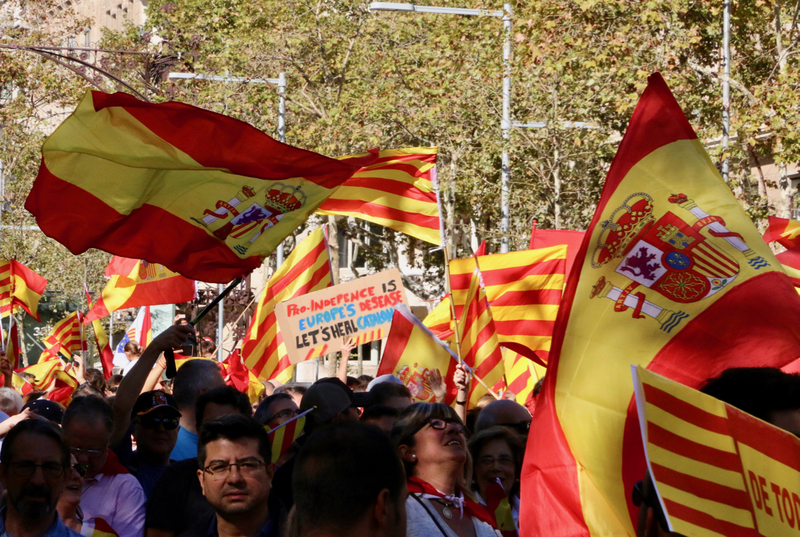 A smaller group of extreme right-wing ultras joined the demonstration holding signs like: "The Unity of Spain is Not Voted, Not Dialogued, But Defended." Some of them ended up insulting local police near the Catalan government palace in Placa Sant Jaume. The regional elections now called for 21 December are at the centre of the Spanish government's strategy to "restore democratic legitimacy". For the separatists, the vote will pose a strategic challenge. If they take part in the elections, they will be accepting orders from Madrid and the failure of the republic. If they don't, they are most likely to lose out on four years of power in Catalonia. "As long as Puigdemont is not in prison, he can run for the election," Spanish foreign minister Alfonso Dastis said over the weekend. "In the next few days we will have to take a few decisions and they will not always be easy to understand," Junqueras admitted in his newspaper open letter. 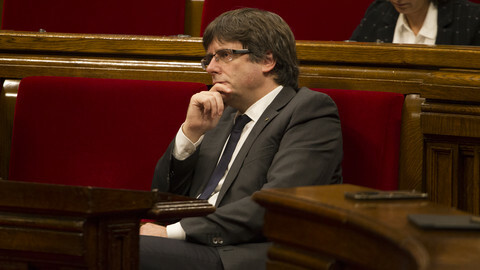 Carles Puigdemont has rejected calls for elections in Catalonia, and put the blame for the continuing deadlock on the Spanish government's "irresponsibility". 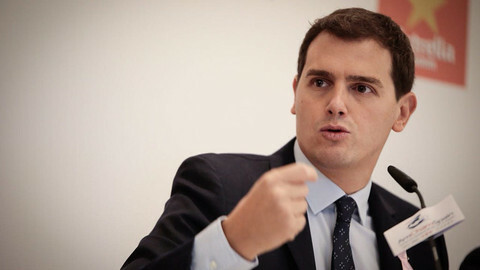 Rivera, whose party could claim regional rule after 21 December elections, spoke of urgent need to "reconnect the people of Catalonia". Madrid in 1997 introduced asylum rules into the Amsterdam Treaty that makes it almost impossible for an EU national to claim asylum in another EU state. Belgium, however, appears to be an exception.